Description of "Handfuls Of Sand "
Susmitha is a twenty two years young girl. Even she lost her parents at her tender age itself, she was courageous and managed her life with her uncle, aunt and their son who were living along with her in her big palace. But when she came to know that her uncle’s family was ready to take her life off to get a hold on her properties she shocked and did not know what to do. Moreover the tradition in her family which the fathers were following for generations together to write wills with conditions that their daughters should marry only after attaining the twenty fifth year and they should get right over the inherited properties only after attaining the twenty fifth year was really put the life of Susmitha in a grave danger. At that time she remembered only one person, Madan with whom she was in love for a long time and decided to go there. But the problem was Madan did not know about her love on him and in fact he was angry with her because of Susmitha’s rude behavior in the past. Still she went there as that place was quite far from her house and there was no chance that her uncle’s family knew that she was there. After she reached the Madan’s place, she has to blackmail him with a secret that she came to know about him after she reached there to secure stay in his house. But before long the misunderstandings and disputes between them cleared and Madan came to know the love that Susmitha had on him and they were the happiest love and lover until Mamatha who loved Madan madly but rejected by him and fallen into a fast flowing river and supposed dead came before Susmitha when Susmitha was all alone in the mango tope in that village. Then the rest was a test to Madan. Susmitha started seeing Mamatha and behaving hysterically. Sukanya, a psychologist, who is a relative and friend to Madan came to the Madan’s house on Madan’s request to solve the problem. Madan almost became mad when Susmitha said that Mamatha entered into her body. Circumstances forced Madan to believe in devils. He even agreed to take a warlock to home as per the Vineet’s advice to expel the devil from Susmitha’s body. But he became aghast when that warlock also failed to exorcise the devil from Susmitha’s body. However, here Sukanya realized how much she was in love with Vineet who was also living in the house of Madan and a relative to them with whom she quarreled a lot and whom he hated a lot in the past. Her efforts to make her heart not to feel for Vineet did not work at all. It irritated her even more when Vineet was going away from her while she was trying to be near to him and express her love. Anyhow she could get success in gaining Vineet’s love but not in solving the problem of Susmitha. Susmitha suffered to the maximum extent possible to fulfill the conditions of Mamatha to make her leave Madan forever. She became the dearest to all the family members of Madan and all of them have agreed for Susmitha’s marriage with Madan. As the matters stood thus, Susmitha reached her twenty fifth year and got right over all her properties. Even still Mamatha was in Susmitha’s body as per Susmitha’s saying, Madan married her. After the marriage, when Susmitha took him to Mamatha’s home, there he received the worst shock by seeing something which he could not believe at all. The other novels of this author Closed Doors (A Suspense, Romantic And Psychological Thriller), Heaven’s Gates, Morning Mist, Fallen From Heaven, Secret, Lukewarm and two self-help books Body, Mind And You and Infinite are available as e-books on Amazon, Barnes And Noble, Kobo, Pothi, etc. and as paperbacks on Amazon and Pothi. 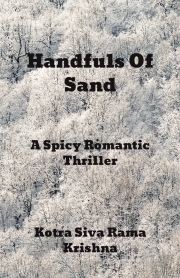 Reviews of "Handfuls Of Sand "